Merissa Hanning came into this year’s Victory Lane Camp summer sessions with a love for serving others. She left with a renewed passion for studying occupational therapy and with a clearer perspective on the value of growing relationships with families who have kids with special needs. Merissa served at both summer sessions of camp, working with the TIMS (Teens and Mission) and directly with Victory Families. 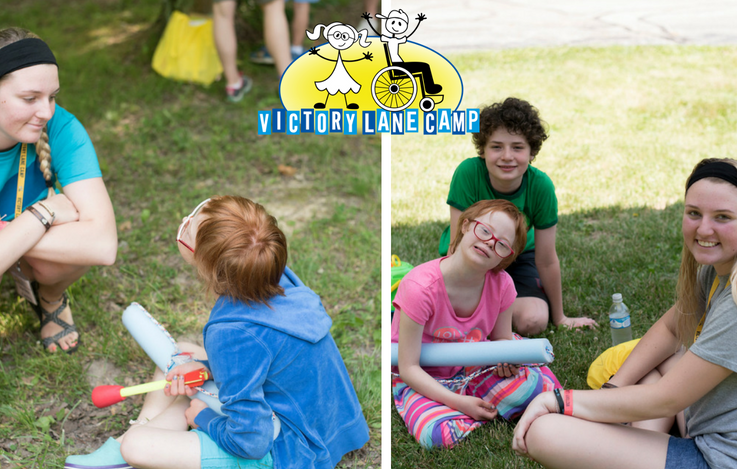 “One of my favorite parts about serving at Victory Lane Camp was building relationships with the kids and being a role model and encouraging them and their families throughout the week,” Merissa expressed. During both weeks of camp, Merissa had the opportunity to connect with kids by being with them during meals, activities, and free time. One of Merrisa’s favorite places to connect was at the pool. Swimming together provided her with the opportunity to spend time with the kids and families in a way that was both fun and relational. “Swimming always helps the kids trust us more and it grows our relationships together, especially in the beginning of camp,” she explained. There were some points during the summer camp sessions where she faced exhaustion. Merissa, however, was able to focus on the Victory Kids, and this change in focus reminded her of her love for serving others. Both summer sessions helped her develop perseverance and reminded her of her love for the field of occupational therapy. As Merissa was discovering more about her future career throughout the summer, one thing specifically she learned was to love on the families as much as the kids. Not only did Merissa serve at Victory Lane Camp, she was also a clinic assistant at 321Go Kids this summer. She plans to continue to learn more about occupational therapy as she attends the University of Southern Indiana this fall.